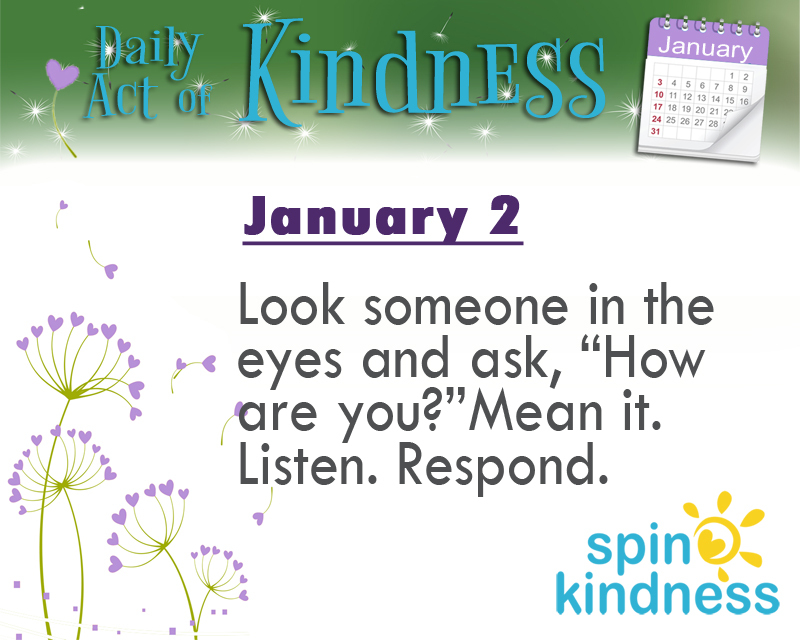 It’s a new year, a fresh start and the perfect time to refocus on kindness! Today’s Challenge: Look someone in the eyes and ask, “How are you?”Mean it. Listen. Respond..
Kindness needs to come from a place of authenticity. How many times has someone asked, “How are you?” only to turn away and start a conversation with someone else before you respond? Although the question can be considered a greeting to many, it doesn’t have to be a meaningless question. Try asking the question in different ways. Ask it of everyone you encounter. Truly listen and connect. Acknowledging and caring about someone will not only show kindness, it will bring happiness to the other person who may, in turn, show kindness to others. Want to learn more? Here’s more about how authenticity matters both personally and professionally. Share your experience? How did people react when you truly listened?